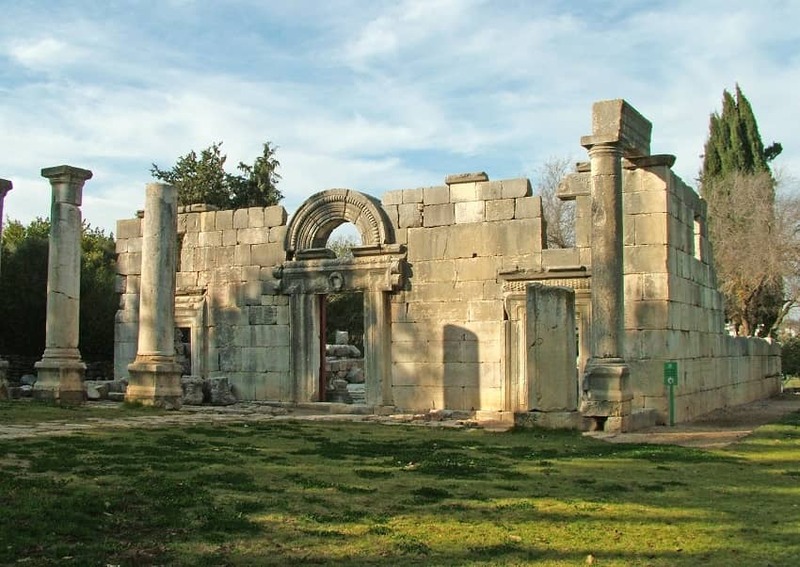 Kafr Bar'am synagogue was built circa 220 CE, most probably in honor of Rabbi Shimon bar Yochai. The architecture is similar to that of other synagogues in the Galilee (such as Capernaum Synagogue) built in the Talmudic period. The front entrance of the synagogue has three doorways that face Jerusalem, and had eight columns with Attic bases which supported a porch. The interior of the synagogue was divided by rows of columns into three aisles and an ambulatory. The synagogue had a six column portico which is a bit unusual. The Kfar Bar'am synagogue is preserved up to the second story and has been restored. The synagogue is made of basalt stone, standard for most buildings in the area. A carved frieze over the central entrance features a winged victory and images of animals and, possibly, human figures.